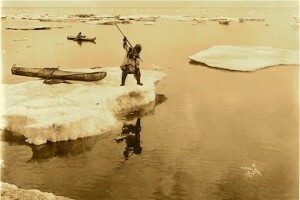 Eskimo hunter watching for seal, Nome, Alaska. ASL-P240-210, George Parks Photograph Collection, Alaska State Library-Historical Collections. The Alaska Historical Society is dedicated to the promotion of Alaska history by the exchange of ideas and information, the preservation and interpretation of resources, and the education of Alaskans about their heritage. the exchange of ideas and information, the preservation and interpretation of resources, and the education of Alaskans about their heritage. Governed by a 15-member board of directors, the Society provides a forum and a vehicle to achieve these goals. AHS is a membership organization with 480+ members. Each year the Alaska Historical Society holds its annual meeting in different cities around the state and presents a public conference on selected topics in Alaskan history. These meetings give members a chance to share the latest research into Alaska history, as well as swap stories about the old days. Papers presented at the society’s annual meeting have dealt with a wide variety of topics as they relate to Alaska, such as the church, oral history, education, transportation, women, the military, the fishing industry, maritime history, aviation and many more. The Society also publishes an award-winning semi-annual journal of historical scholarship, Alaska History, which is free to members and available for subscription or purchase. Its articles cover every facet of Alaska’s fascinating history, from mining to education, from exploration to biography. The book review and Alaskana sections keep readers apprised of publications and activities of interest. Alaska History News is published four times a year and is distributed free to members. This newsletter informs readers of events, new publications, local historical society activities, governmental policies affecting history programming, and provides information on new resources available for the researcher or local society.